A legal contract handwritten on vellum dated 1493, signed by six persons. 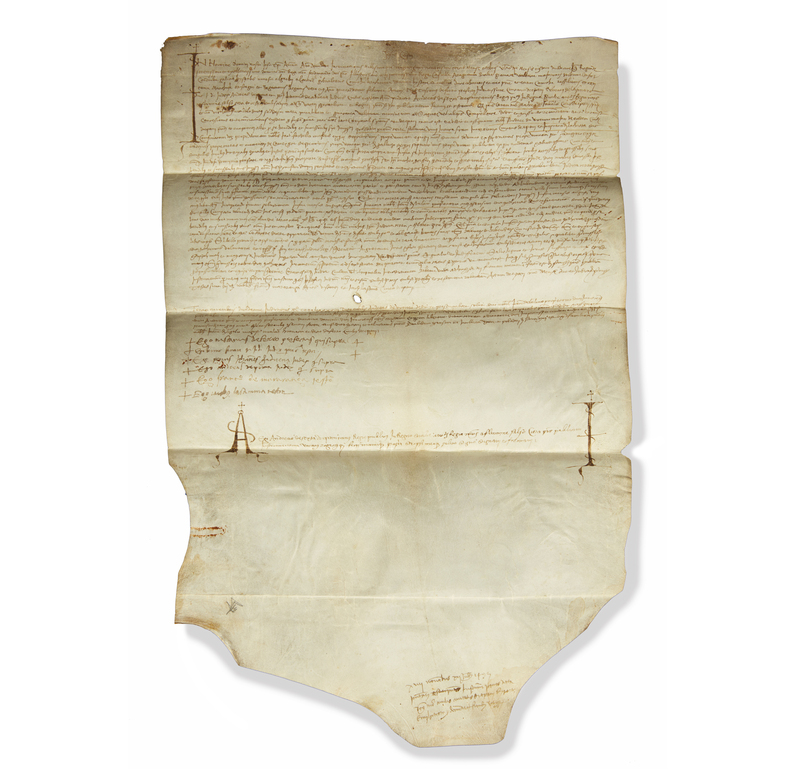 This large folded document is either French or Italian and is dated 1493. It seems to be a contract between Andreas and Jannolo. The script is clearly not monastic, as it is written too unevenly for it to be from a scriptorium. The vellum sheet is unevenly cut at bottom and at one side, to facilitate folding. Dimensions: (as folded) 12.37" x 4.25". Processing and shipping within the continental U.S. $32.00 plus 1.5% replacement cost insurance. Very good condition with some ink stains, a rust stain from a paper clip, a small hole and a tear. 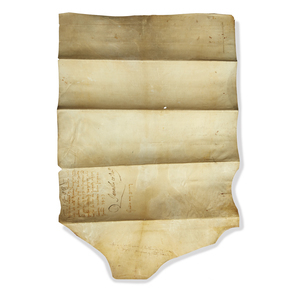 The vellum is irregularly cut, as seems common on period legal documents. Witherell's strives to provide as much information and photographs as possible but encourages in-person inspection by bidders. Condition statements are only for general guidance and should not be relied upon as complete statements of fact and do not constitute a representation, warranty or assumption of liability by Witherell's. All lots are sold "AS IS" under terms and conditions. Please be advised we do not furnish packing materials nor porters for pick ups.